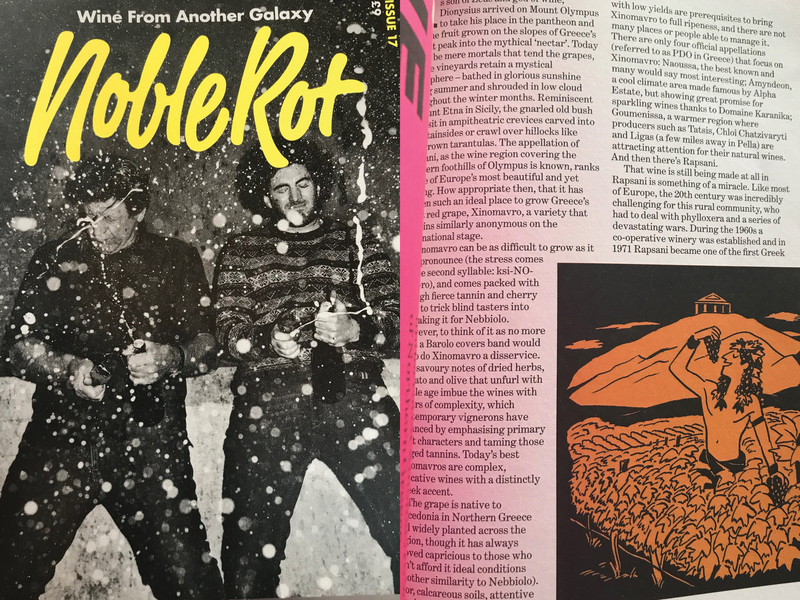 Noble Rot is an unconventional wine magazine; it is distinctive and contemporary in its writing, presentation and selection of wines. Simultaneously, it includes fascinating topics which are relevant to wine culture, gastronomy, and even art. Just read ‘Food on Film’ in the current issue, or the story ‘A hashtag away’ in a previous issue. I consider it more of a wine book, rather than a simple magazine, as each issue provides extensive food for thought and heterogeneity. In short, NR is a magazine that you cannot wait to get your hands on, as soon as it circulates. I get the same feeling every time I open my mailbox and grab the latest publication. This time I had one more reason, as there was a piece on Xinomavro written by Mark Andrew MW, co-founder of NR together with Dan Keeling. Unfortunately, by the time I left for my vacation, NR issue 17 had not yet arrived to Athens. But, the good news is that Mark gave me a copy, when we met for dinner a few days ago, at one of my favourite food places in Athens, Nolan. This is the second extensive article on Greek wine written by Mark, a firm supporter of Greek wine. Issue No.6 included the article ‘The Big Blue’, which featured a picture of the late Haridimos Hatzidakis, which I now see more as a farewell to a genuine Greek winemaker. The article, of course, refers to the jewel in the crown of Greek wine, Assyrtiko from Santorini. Both articles about Greek wine are amazing and point out the diversity of Greek terroirs, and also talk about how Greek wines sidestep monotony by offering a style of wine, which is different to that of international wines; a style that involves emotion, heritage and authenticity. Both stories are definitely worth a read. Read them below (published with the permission of NR).